The year of the Horse as per Chinese – Horse which can take people to their destination , Symbol of traveling and also sign of speedy success. Get ready for thrilling year. A year of opportunities is waiting for you . Plan your career and let MoreVisas help you plan your future, you can migrate, study, travel &, work. MoreVisas can assist you to obtain any of these visa categories , you just have to have the urge to explore with us the opportunities which are awaiting for you to grab. 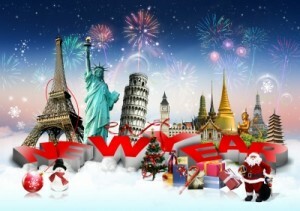 Western countries invite the new year with dancing parties and food . People gather at the Trafalgar Square in London to hear the chimes of London’s big Ben as it announces the New Year arrival .in Spain they eat a grapes for each toll to bring them good luck in the next twelve months . In South America a dummy straw person is burned outside the home at midnight . Australians make noise with rattles , whistles , church bells to bring in the new year . South Africans ring the church bells and gun shots are fired in the carnival atmosphere during New year. The World has its own way of celebrating the New year , Competitive and with a capability of working hard a person can achieve anything they want to. MoreVisas wishes our clients a Happy &Prosperous New year and with its certified and highly professional team is all set to lead and guide you to your dream country for Immigration in the year 2014.